With only a few minutes to make a great impression, approaching recruiters at Careers Fairs can be intimidating. Talent Acquisition Manager at Enterprise Rent-A-Car, Regina Van Burkle gives some great advice about how University of Surrey students and graduates can appear more confident in front of graduate recruiters. Regina Van Burkle, who has been leading graduate recruitment with Enterprise Rent-A-Car for over 20 years, shares her advice for being more confident when approaching recruiters at careers fairs. She recommends having a look through the list of recruiters that are the Careers Fair in order to work out which recruiters you would like to talk to, so that you can do your research in advance. Next Giacomo interviewed University of Surrey alumni Yatin Vadhia, who is now a Product Manager for some of Expedia’s leading technology products, such as the Hotels.com iPhone app. According to Yatin, the best thing about working for Expedia is the diversity of people he works with across the globe. University of Surrey student Alice Aspdin has recently joined the HR graduate scheme with Vodafone Group as part of the team coordinating graduate and internship recruitment. Alice believes the best thing about her new graduate job with Vodafone Group is the real responsibility she’s been given from day one. She explains how being thrown in at the deep end on day one has really given her a lot of exposure to different areas of the Vodafone Group business, and how she is able to get involved with many different projects, such as Learning and Development and Rewards. When asked for her advice for applying for graduate positions, Alice firmly believes that success comes from really doing your research. As Vodafone Group is such a large organisation, she states that candidates need to be clear about the role they are applying to, so make sure you do your research before applying. Alice also recommends how it’s important to treat any online interview as importantly as you would a face-to-face interview! Finally, her advice for networking to get the job you want is look for events in the areas that you are interested in, in order to meet the right people. Plus, she said it’s critical to check your online presence is professional and bang up to date, particularly your Linked In profile, as it’s a tool that many recruiters use. 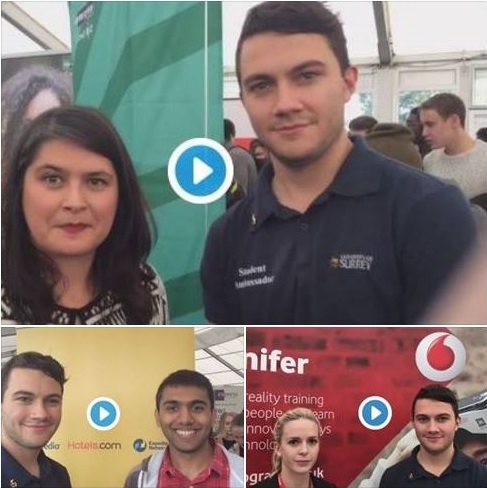 Want to meet leading graduate recruiters right here on the University of Surrey campus? Then check out our calendar of free employer careers events right here!